Patons were another main brand when rug-making was popular. 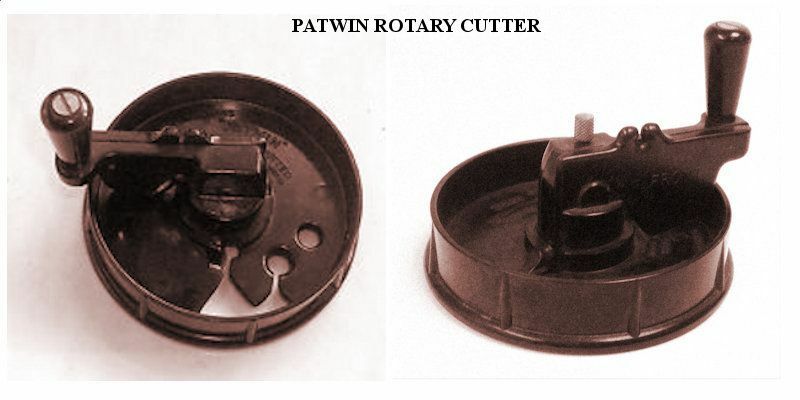 Though referred to as Patons, the company was Patons & Baldwins. 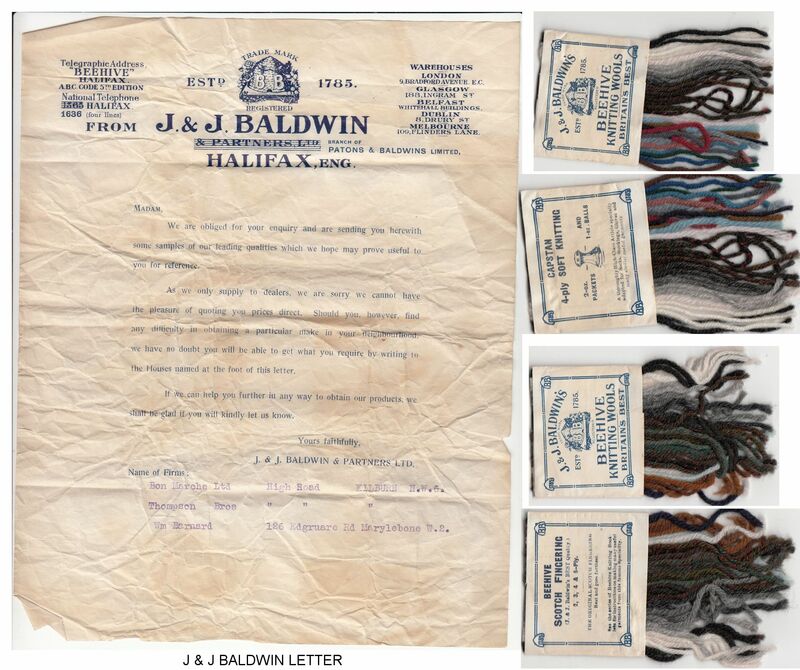 Baldwins was founded in the late 1770s by James Baldwin of Halifax, England; Patons was founded about 1811 by John Paton of Alloa, Scotland. 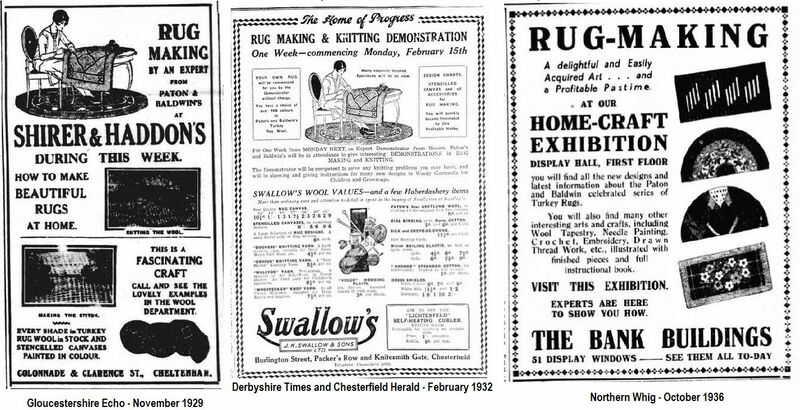 They merged in 1920 and their brands included "Patons Rose" and "Baldwins Beehive" (the beehive with the P&B logo is on my wooden wool cutting guide). The company was merged with J & P Coats Limited in 1961, though the Patons trademark is still used. 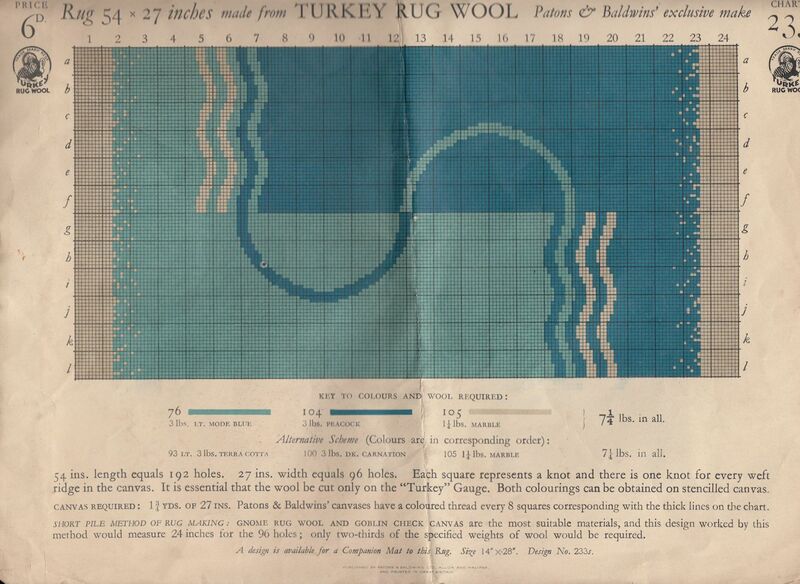 Here's an excerpt from "The Hooked Rug" by American writer William Winthrop Kent in 1930 (A Record of Its Ancient Origin Modern Development Methods of Making Sources of Design Value as a Handicraft. The Growth of Collections. 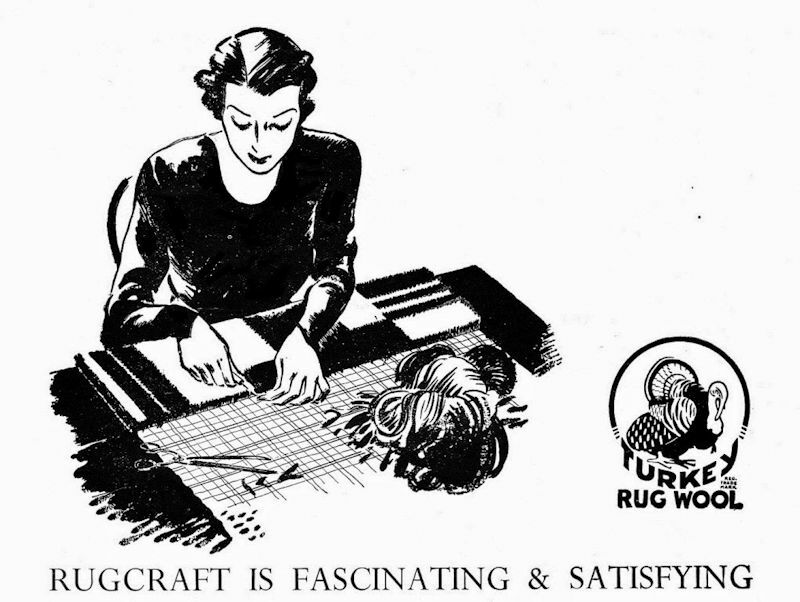 Probable Future in America And Other Data): Another method of rug making, now practiced in England is revealed by an advertisement. It surely must have come from the prodding or brodding and hooking processes or is at least closely akin to these and to the hooked tambour work. 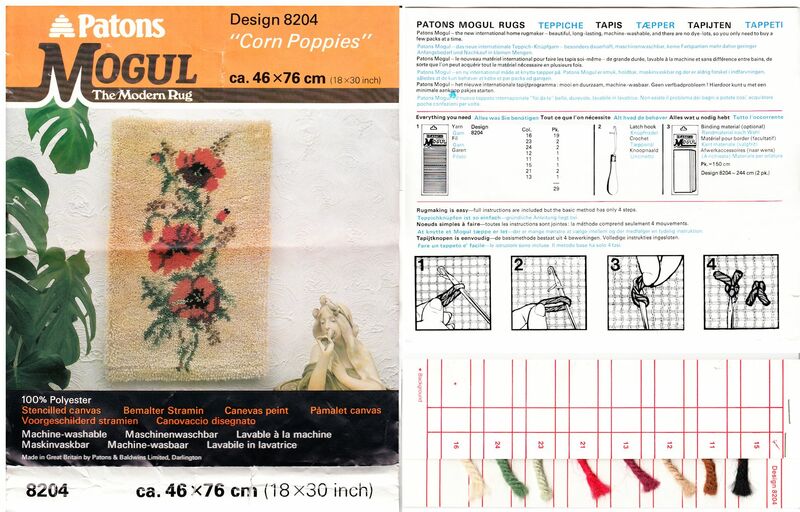 A canvas is used like cross-stitch canvas only coarser, which has every third mesh a large one. It is held on the knee or on a table. The pieces of wool yarn are cut exactly the same length by a gauge. The hook used has a catch or latch on it, (see illustration, ' English,' in plate #i), and is inserted in one hole and out the next in the next row, as follows: The wool is held in the left hand and above the canvas, then doubled and the double end is slipped over the hook, the catch being up or open. The hook is then drawn out through the canvas toward the worker, the cut ends being kept in the left hand. The catch by this action drops down and secures the wool. The tool is next pushed forward through the wool loop and catches the two ends held in the left hand, then the loop is held in the left hand and has the two ends pulled through it with the hook. To pull out hook and draw tight the two cut ends finishes the knot. 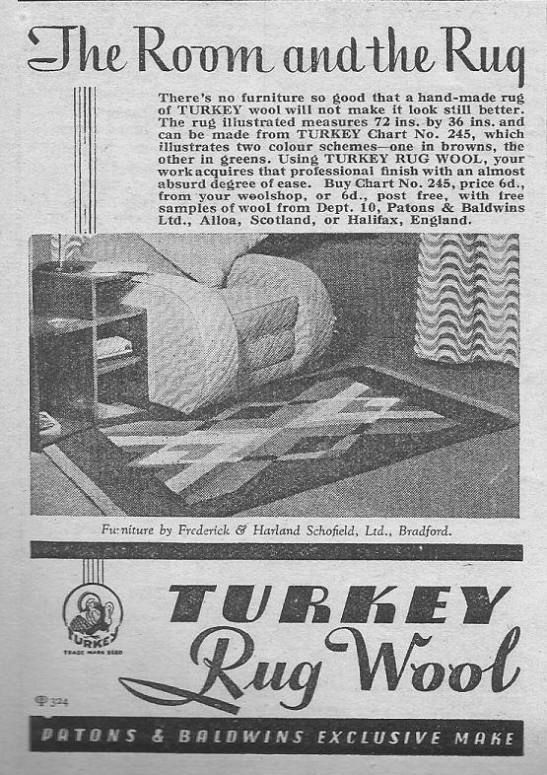 This is really a pile fabric and is known as a Turkey Rug but sprang from the hooking process as the earlier hook used was of the crochet hook form. All the -implements for this are on sale at "The Pattern Shop,' 13 Southampton St. Strand, London W. C. and the wools are made and sold by J. & J. Baldwin, Halifax, England. A full account of the process was recently printed in 'Leach's Sixpenny Knitting Series, 23." Their rug products bore the Patwin or Turkey brand names. Patons are still well-known for their knitting and crochet wools and are now owned by Coats, though they no longer produce rug making products. 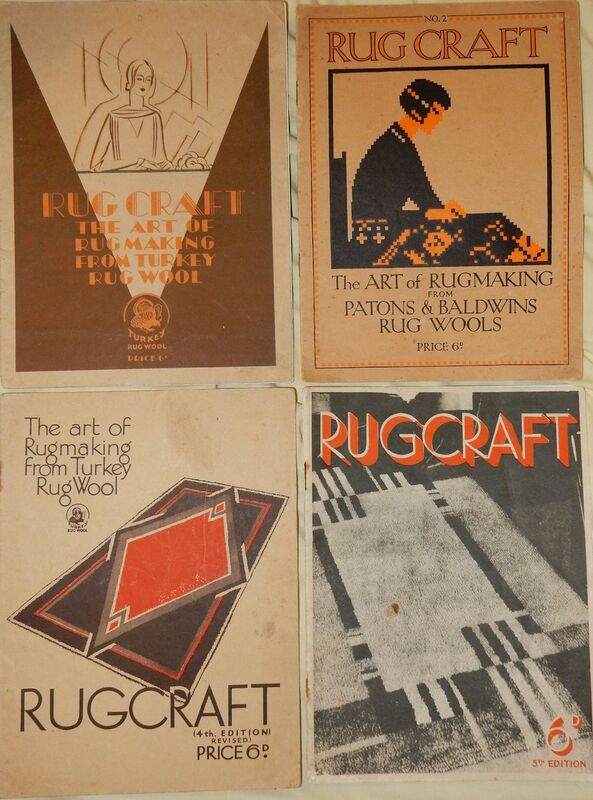 Patons produced kits, skeins of rug wool, printed canvases, a rug wool cutter and a magazine. 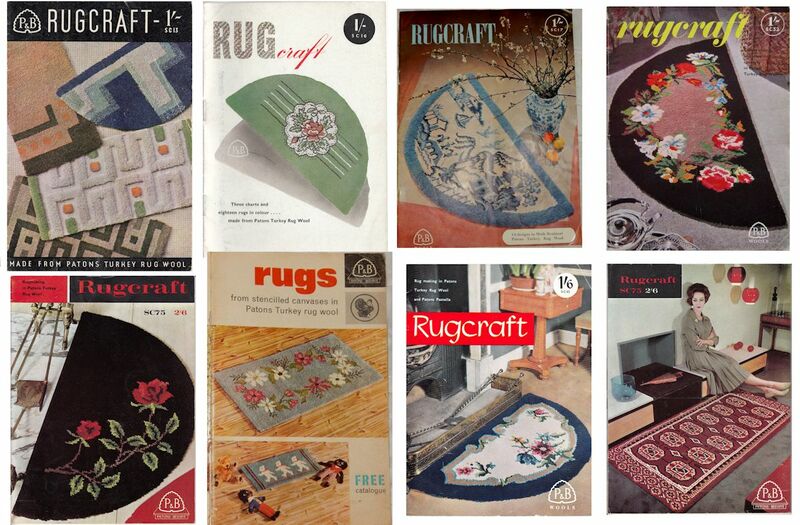 Their "Rugcraft" magazine, of which I have several issues, contained charted patterns for rugs while their "Rugs" catalogue allowed the rug-maker to buy stencilled canvases and packs of wool for most of the same designs. Skeins of rug wool could be cut to length using their "Patwin" rug wool cutter - a razor blade (that went blunt a bit too quickly for my liking) and winding handle device. I used to have one of these (inherited along with some wool and canvas), but it vanished during one of my house moves. 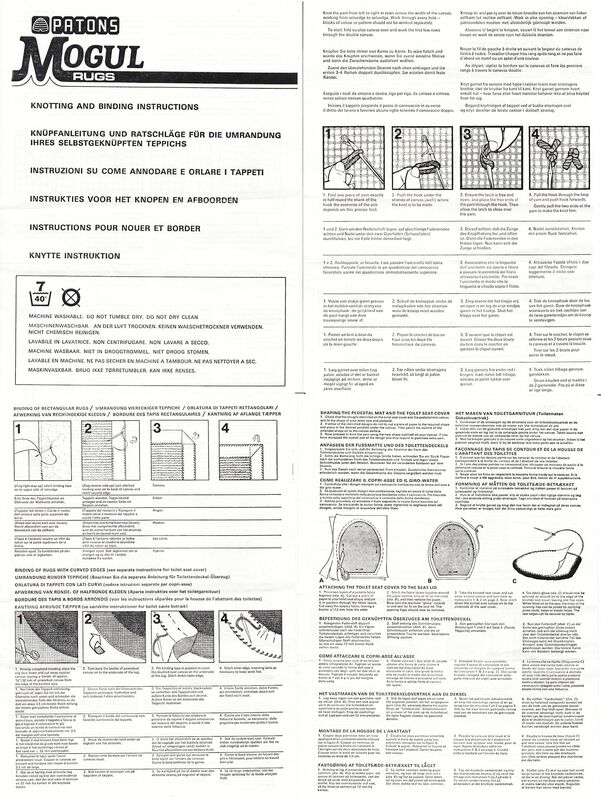 Patons also produced the wooden "Turkey Rug Wool" cutting guides that I still use today. 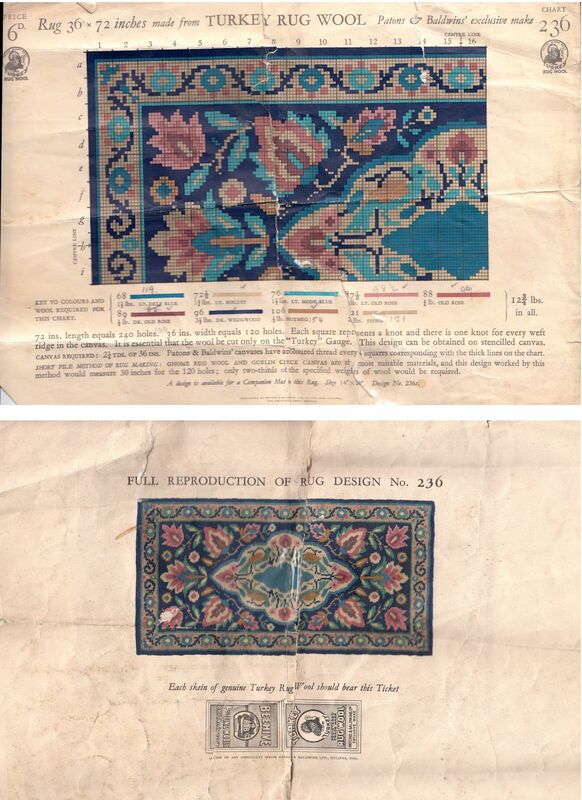 Circa 1940s/50s - a Patons Turkey Rug Wool pattern sheet. If you look closely, you'll see that it has 8 holes per guide square, rather than 10 holes (3.3 hpi). When I first bought canvases there was a choice of "8 hole" or "10 hole". 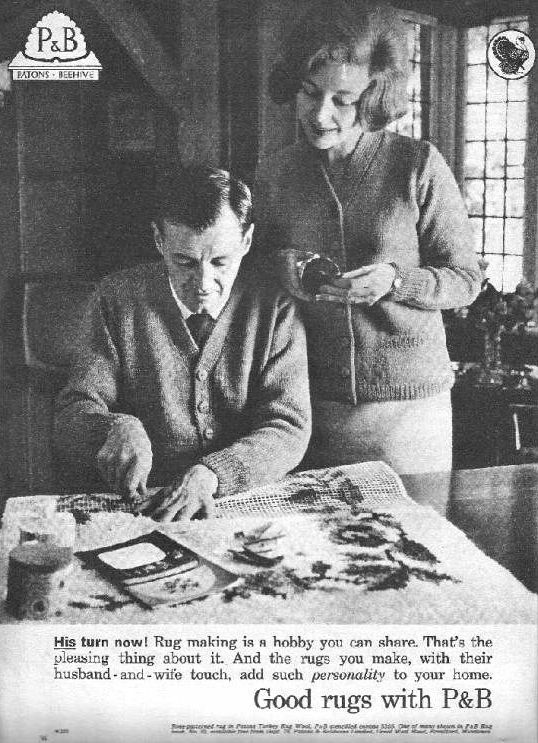 While Turkey wool was produced specifically for latch-hooking, Gnome Rug and Embroidery wool was sold for stitched rugs, though it's usable for hooked rugs as well. 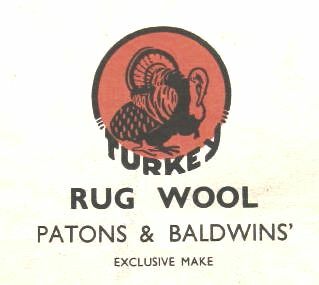 In addition to Turkey Rug Wool, Patons later produced their acrylic Mogul Rug Yarn. 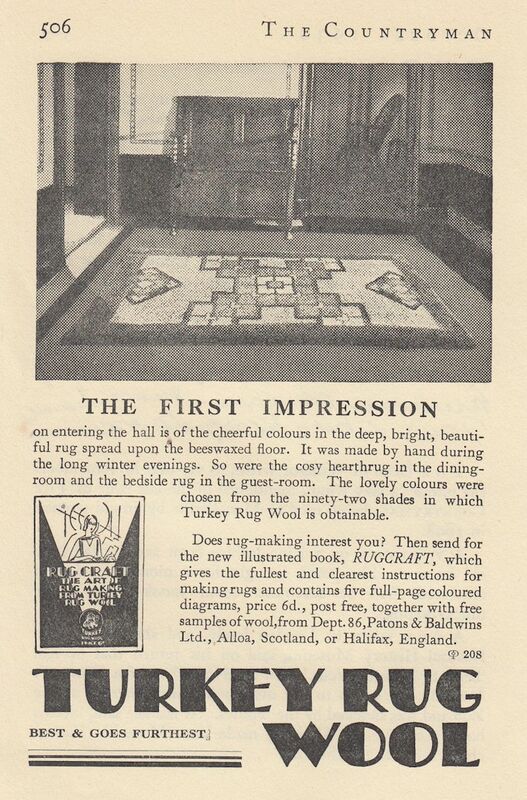 Turkey Rug Wool was later produced by Atlascraft Ltd of Bingham, Nottingham (formerly Willoughby (21) Ltd). 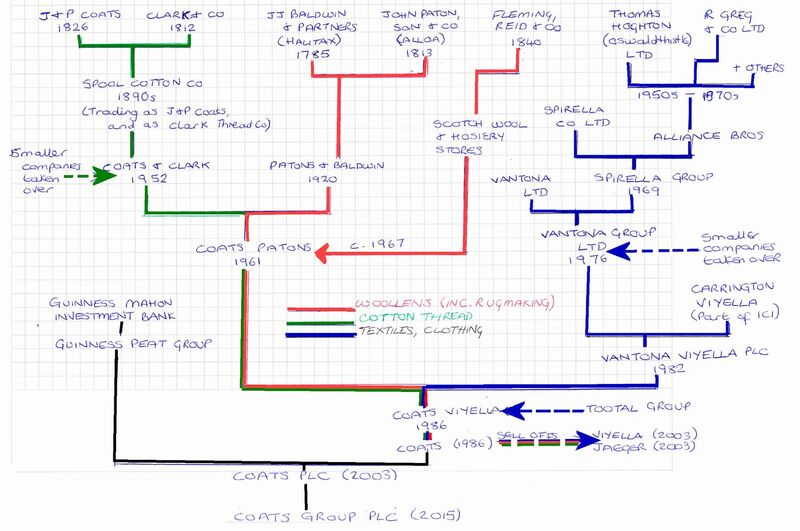 Atlascraft Ltd (Notts), was a textiles fibres and spinning company founded in 1994 and wound up in 1999 due to insolvency. 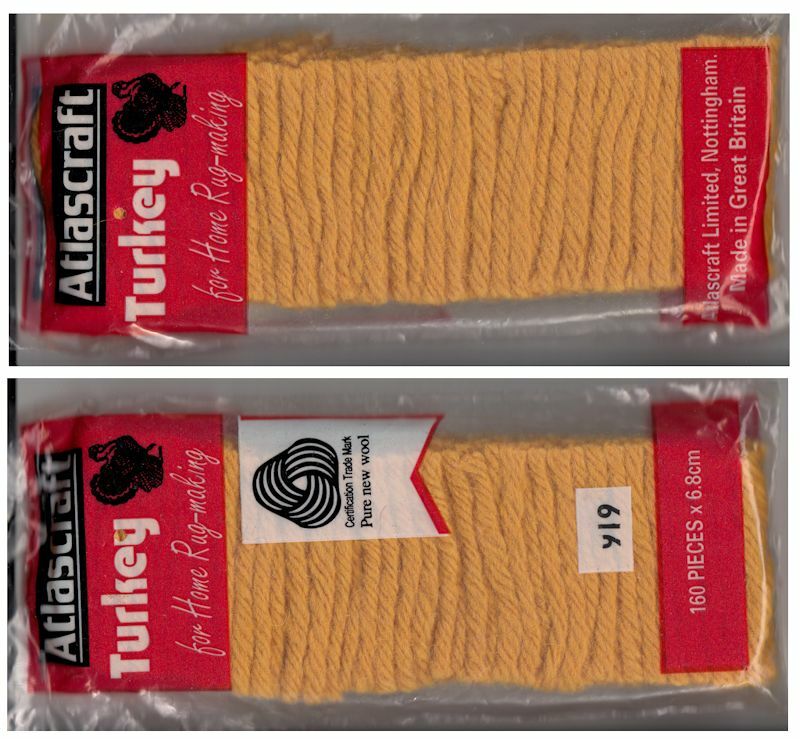 A current company called Atlascraft Ltd (of Bolton, Lancashire) was founded in 2006 as a mail/internet order company and is described as a long established family run company selling needle craft supplies, including Anchor wool. Elite Crafts & Products Ltd in North Canterbury, New Zealand purchased the original Coats Patons Turkey rug wool machine and are reintroducing the full colour range of the rug wool plugs (packs) using 100% New Zealand wool which they sell to the wholesale trade only. 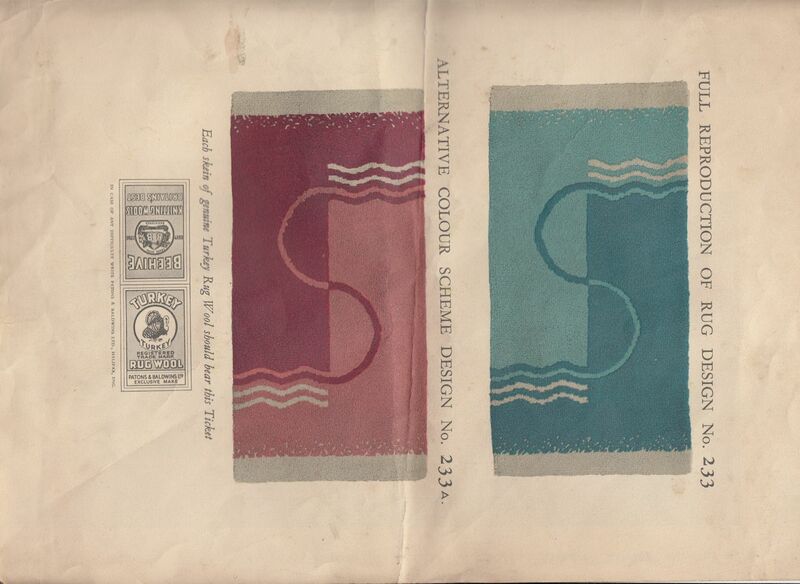 Coats Patons Turkey Rug Yarn was sold there as Semco Rug Yarn before Semco closed down.